Job’s mini-autobiography in the twenty-ninth chapter of his book is truly inspiring. It is clear that he was afforded much respect by those that knew him or knew of him. It would be easy to assume that he was respected because of wealth or position, but that was not the case. The key to Job’s popularity lies in the following verses. He was a man of action when it came to ensuring that needs were met, that the oppressed or downtrodden were represented and not ignored. The result of those action-words by Job was quite evident. Those were the days when I went to the city gate and took my place among the honored leaders. The young stepped aside when they saw me, and even the aged rose in respect at my coming. The princes stood in silence and put their hands over their mouths. The highest officials of the city stood quietly, holding their tongues in respect. Job was not seeking fame, respect or honor. That was the natural result of how he lived his life, his living out his action-words. What am I doing? What are the action-words of my life? And how are those action words applied? Is it something my Lord would approve of, or have to turn his back on in disappointment? Lord, please help my action-words to be ones that honor you. In Jesus’ name, Amen. This entry was posted in My Posts and tagged Job on December 23, 2009 by tinybeetle. Most people are familiar with the parable of the blind men who examined an elephant. If you are not, the account is below. that each by observation, might satisfy his mind. Though each was partly in the right, and all were in the wrong! and prate about the elephant, not one of them has seen! Each man thought he understood the shape, nature, and function of an elephant. And while each man was right in his individual limited assessment, those of us who can see the entire elephant know that each individual man was entirely wrong. Like the blind men examining the elephant, Job’s friends have been groping about in the dark trying to ascertain the shape of Job’s suffering and pain. And while each thought he understood, each understood nothing. In response, Job asked a question about wisdom, twice. A little while later, in what surely was a God inspired utterance, Job made the following statement. Like those of us with complete use of our senses examining an elephant, God has completely and thoroughly examined wisdom; he knows everything there is to know about it. That says it all. Later writers of scripture said exactly the same words. The sum total of wisdom is to fear God and do good. Father, thank you for showing me the truth about wisdom – something that like the blind men I could never understand in my limited perception. Thank you for sending Jesus to live in me so that I can have your wisdom. Thank you for life. In Jesus’ name, Amen. This entry was posted in My Posts and tagged God, Jesus, Job, wisdom on December 22, 2009 by tinybeetle. In the dark early morning hours of August 29th 2005 New Orleans Louisiana was forever changed. Churning off shore and heading toward the city was a terrifyingly beautiful Category 5 hurricane. Although it decreased in strength to a Category 3 storm by the time it made landfall, the most devastating part was yet to come. As the center, the most intense part of the cyclone, was pounding the downtown area, storm-surge control levees began to fail. Massive flooding ensued. Some areas of the city were inundated with 15 feet or more of water. Wind destroyed windows and roofs at random. Belongings, and lives were carried away with the wind, rain, and flooding. 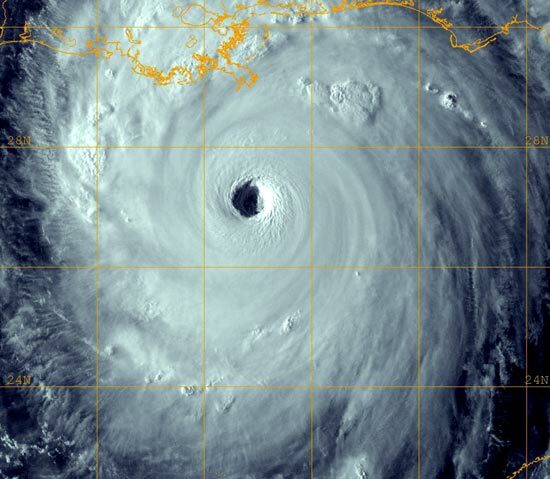 Final death toll estimates are that over 1,400 people died as a result of Hurricane Katrina. The monetary damage, while still not completely understood, is over $100 billion. Post storm, thousands of people were trapped by the flooding for days, even weeks, trying to flee the destruction and terror. Storms of life will come. It is just a fact of life, a sometimes very painful fact. The question is what will be the outcome on us? How will we deal with the aftermath? While much of the world turned their attention to New Orleans and the cleanup immediately following the devastation of that city. Now, four years later, it is largely forgotten. The Federal Emergency Management Organization maintains a list published of the various organizations that are still engaged in efforts for the Katrina victims. Notice the makeup of this list. Of the 18 organizations listed, only 3 are not directly Christian related. They are comforting with the same comfort they have been given. Jesus has not forgotten them, nor have his people. Father, may I never grow callous to the needs and suffering of others. Please help me see with Jesus’ eyes. In His name. Amen. This entry was posted in My Posts and tagged God, Jesus, Job on December 20, 2009 by tinybeetle. In the twenty-sixth chapter of Job is a mention of a seeming astronomical anomaly. Up until just a few years ago it was believed that the Northern sky was nearly devoid of stars. If you look up you’ll see some constellation patterns, but that is all. However, with the advent of the Hubble Space Telescope that area of space revealed something astounding. 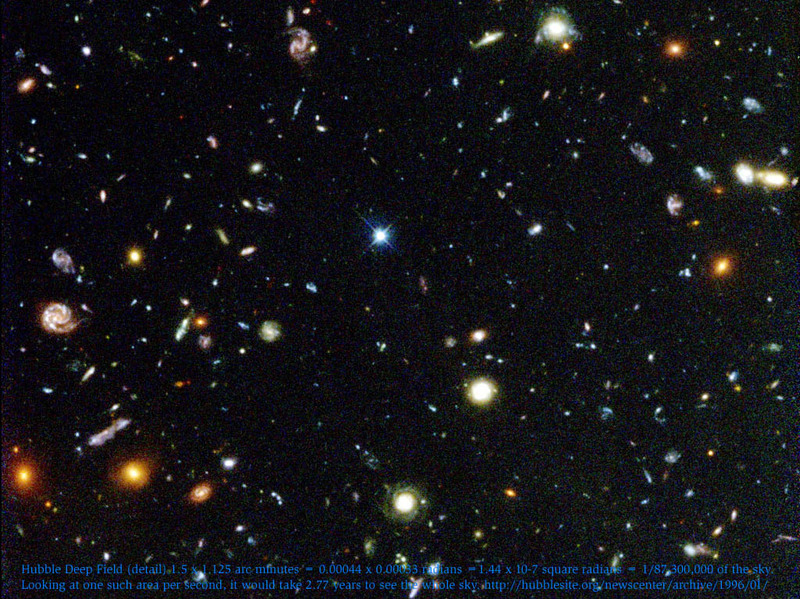 In a five day multi-pass exposure of deep-space in the Northern Sky, Hubble uncovered thousands of Galaxies in just a very minute slice of sky. That’s Galaxies, not stars or planets. It is truly mind-boggling. So, does this prove that the Bible is wrong? Of course not. That would be stupid. Job was a man just like us, he was merely speaking about what was known at that time. If anything, this discovery shows just how vast God’s creation truly is. Lord, thank you for incredible beauty hidden in plain sight, just waiting to be discovered. You are an amazing craftsman. I’m looking forward to exploring it all. In Jesus’ name, Amen. This entry was posted in My Posts and tagged God, Job on December 18, 2009 by tinybeetle. There used to be Christian comedian out there by the name of Mike Warnke. He apparently got into some trouble regarding lying about his past and disappeared off the radar. I remember seeing him once, many years ago, at a local church. One of the bits he did was a song that reminded me of the following chapter in Job. Mike Warnke’s song was set to the tune “A Mighty Fortress”. The section that stuck with me was as follows. Oh Lord, I am but a worm. That appears to be Bildad’s view of all of mankind, and how he feels that God views us. But is it really? Did you notice that now he (Christ) has brought us back as his friends? Worms? Perhaps before Christ. But now, I think not! Too high a price was paid for me to think that I’m but fish-food. It would be an insult to Christ to live with that belief. Father, thank you for living through Jesus and reconciling me to you. Thank you that I am no longer destined for hell, but instead am counted as your friend. In Jesus’ name, Amen. This entry was posted in My Posts and tagged friends, Jesus, Job on December 16, 2009 by tinybeetle. I don’t have much to say about the twenty-fourth chapter of Job. However, the following verse did stick out to me and made think about The Light. The Apostle Paul called Christians Children of the Light. Jesus also called those who believe in the light Children of the Light. When Simeon prayed to God, while holding the baby Jesus, he had the following to say about him. Jesus later identified himself as the light of the world. So I see that Jesus himself is the light. And if I believe in him I am his child. Father, thank you for lighting my dark world with the light of Christ. May I live my life as a child of the light. In Jesus’ name, Amen. This entry was posted in My Posts and tagged God, Jesus, Paul on December 15, 2009 by tinybeetle. I read something today that made me stop and think. The events of the book of Job would have taken place around 1700 BC. God’s commands won’t be written down until hundreds of years in the future (about 1500 BC) when Moses receives them on the tablets, and then by direct conversation with God during the sojourn in the wilderness. So what commands is Job referring to? In doing research, I found that there were earlier codified forms of law. Then there is the famous code of Hammurabi. And there were others. So it would appear that there was enough law available from which of determine right and wrong. At least right and wrong as defined by man. But what about God’s definition of right and wrong? The writer of Romans makes it clear that from the time the world was created people have had knowledge of God. The only issue has been, what they do with that knowledge. Father, unlike Job I actually have your written word, your will for my life readily available. May I have a burning desire to do what it says so that in all my ways I please you. In Jesus’ name, Amen. This entry was posted in My Posts and tagged God, Hammurabi, Job, Romans on December 14, 2009 by tinybeetle.